Carrie Haddad Gallery announces their mid-summer exhibit Interior/Exterior with artists Stephen Walling, Patty Neal, Scott Foster and Joseph Maresca. The exhibit begins July 14th and runs through August 14th. 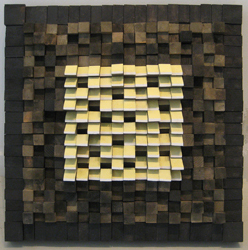 Germantown artist Stephen Walling is back at the gallery with new three dimensional wall reliefs. Each piece is completely different from the next, but all are made with scraps of wood that the artist paints and places in unusual patterns or assemblages. Walling studied with Jack Tworkov and James Brooks while majoring in graphic design at Pratt. He later became an art director at Conde Nast Publications and received several awards for art direction as well as painting. Rhinecliff artist Joseph Maresca also returns with a variety of new paintings. A series of interiors was commissioned by the Vanderbilt Historic House to be reproduced for their Visitor’s Center. Maresca has made each room come alive by filling the rooms with elegant guests dining and partying. Other works are from his Courtesan series of bejeweled women who seem quite at home near the Vanderbilt mansion. The third artist in the exhibit is Patty Neal, who will be exhibiting cityscapes. Some of her work delicately portrays Brooklyn, the BQE, and the Queensborough Bridge, but other pieces in the exhibit combine paintings. San Francisco’s Golden Gate Bridge is the top half of a diptych with a close up of the bay as the bottom half. Another juxtaposes a small wooden house with a pink summer sunset below it. Neal likes to juxtapose atmosphere, light, color, shape and texture in ways that can be literal, conceptual or even abstract. On the other hand, sometimes the intent is to create a sense of traditional landscape harmony despite the use of disparate images. Patty Neal studied art at Parsons School of Design, NY, Art Academy College, SF, and San Francisco State University. This is her first exhibit with Carrie Haddad Gallery. The final artist, Scott Foster, is also making his debut at Carrie Haddad Gallery. Foster will be presenting a series of small watercolors and oils depicting a variety of architectural styles; bungalows, trailer homes, suburban track homes and shopping malls. Foster recently moved to the area from Utah. He currently teaches at Siena College. The reception for the exhibit takes place on Saturday, July 16th from 6-8pm and all are welcome to attend. The gallery is located at 622 Warren Street in Hudson, NY. You can call the gallery for more information or directions at (518) 828 1915. Or see the exhibit online at www.carriehaddadgallery.com.